Learn more about Philatron Wire and Cable's commitment to the clean vehicle movement, green technology and renewable energy industry. Stop by booth #702 to discover many of Philatron’s innovative product lines and learn how Philatron can help with engineering and design solutions. 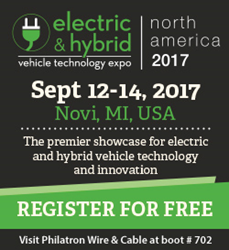 Philatron Wire and Cable will showcase their electric vehicle cables, which are offered in a full line of both straight and coil cables. The EV cables are UL listed TYPE EVJE and TYPE EVE 600 Volt Power Cable, the application of the EVE power cable is extra heavy duty for both indoor and outdoor use. The cables feature greater mechanical strength, lighter weight, temperature, abrasion, chemical, flame, water, and ozone resistant. Being committed to providing the highest standards, our EV cables are rated +105°C to -50°C, with Underwriters Laboratories: UL-62, and National Electric Code: Articles 400 & 625 Standard. Learn more about Philatron Wire and Cable's commitment to the clean vehicle movement, green technology, and renewable energy industry from the sales manager, Tammy Ashton, who will be available at the expo to answer any questions. Register for a free expo pass. Philatron is an ISO and TS Certified Quality Manufacturer.